Malawi – W.E. – The Hamptons – Billboard’s Poll – Britney’s Backdrop – Beth Ditto – Mel B – THE party! Malawi’s president lashed out at anti-government demonstrators Thursday, as two days of protests left at least 10 people dead in unprecedented levels of unrest in this southern African nation. Hospital officials and activists said the victims had been shot with live ammunition, and that at least 44 others in the northern city of Mzuzu alone were being treated for gunshot wounds. President Bingu wa Mutharika vowed to “ensure peace using any measure I can think of” as protesters gathered for a second day in this impoverished country roiled by fuel shortages and price hikes. I am deeply concerned about the violence today in Malawi, especially the devastating impact on Malawi’s children. Malawi must find a peaceful solution to these problems that allows donors to have confidence that their money will be used efficiently. Last month, Madonnarama was the first to announce the secret screening of W.E., which Madonna attended. Apparently there recently was another one. I just saw a screening of W.E. and it was pretty great. It was quick-paced and tense with truly spectacular work in cinematography and editing. Madonna did a splendid job with the screenplay and direction (I didn’t even know she was involved with this film before screening it) and the actress who played Wallis is a scene stealer. Only downfall is Abbie Cornish’s performance. It was shockingly flat and dismal. She took a complex, depressed character and made her lame and stale. Otherwise, a really great, ambitious movie. Andrea Riseborough was the standout performance for sure. She commanded the screen and I had never heard of her before but she really was fantastic. Oscar Isaac was good as well. It wasn’t a real challenging role like Wally or Wallis but he did his job. 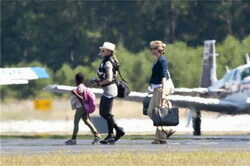 Last weekend, Madonna and her family were spotted at the Hamptons boarding a private plane. The “True Blue” contest is now over. Thank you for all of the fantastic submissions! Madonna is busy in the studio right now but will take the time to you review your entries very soon. The winner of the personalised signed copy of the “True Blue” album will be announced later on so stay tuned! Billboard.com celebrates 30 years of music video television revisiting each decade’s best. Madonna’s Vogue Video is amongst the handful of the magazine’s favorites from the 1990s. Only one thing to do… VOTE! Some footage of the Sticky & Sweet tour backdrop of Human Nature featuring Britney Spears recently leaked. Ynet, the most popular Israeli news and general content website, has learned that Madonna is planning a private vacation in the Holy Land this coming September. In the past two months, Madonna’s managers have been holding talks with an Israeli production company asked to organize the vacation. It’s unclear if Madonna’s planned visit, which is expected to last several days, has anything to do with the Kabbalah Center which she has close relations with. Beth Ditto is currently on tour and part of the setlist is a cover of Madonna’s Vogue. You might remember the first video from Paris, posted a while back, but now we’ve added other performances from Belfort, London and Moscow. Mel B, currently a judge on X Factor Australia, recently went on Oz’s popular syndicated radio program “The Kyle and Jackie O Show” where she was asked to rate the best voices based on audition tapes played for her. Only little did she know the snippets were from some of the world’s biggest entertainers, including Madonna. That sounded like a karaoke kind of drunken laugh. Fashion Gone Rogue posted some pictures of the latest fashion spread by photographer Robert Trachtenberg and fashion editor Anna Bromilow for the upcoming August issue of Tatler. The tongue-and-cheek spread takes a look at the fall collections through the gaze of iconic fashion figures such Madonna, Twiggy and Tina Turner. This summer, Franco-German TV network Arte is broadcasting the “Queens of Pop” documentary series, produced by Jürgen Schindler. Upcoming Friday Madonna will be the main topic. 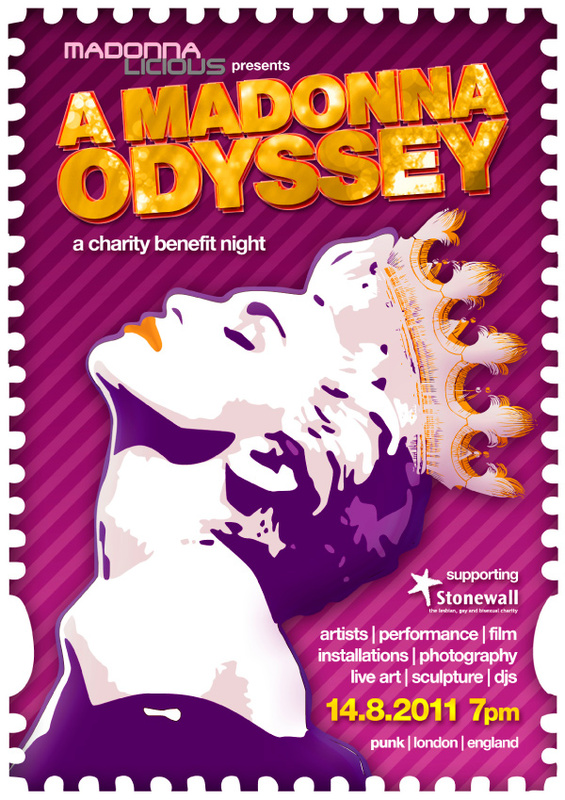 There’ll be celebs getting into the groove, an ‘Express yourself’ Madonna exhibition, outstanding performances, including a madonnalicious cabaret show, an amazing charity auction with ‘cherish’-able prizes, a Material girl shop, the best ‘Hey Mister’ DJs in town and we’ll be searching for a mega-Madge fan who will get to be a ‘lucky star’ in a Madonna documentary. Your hostess for the evening’s extravaganza is none other than the stunning and legendary Chrissy Darling; the UK’s most outrageous, fabulous, door whore and nightclub host!! To kick off this very special night an exhibition celebrating all things Madonna will include expressions of Madonna love in the form of electric art installations, photography, and a selection of unmissable artworks from Roberto Rashella, Magda Prus, Kurt Hoffman and ten year old Alexander Graham. Rare never before seen Madonna memorabilia will be the highlight of the show! Fresh from their dazzling main stage performance on Trafalgar Square at London Pride – Vanilla Lush, Baga Chipz, Vicki Vivacious – the UK’s top showgirls – will star in an all dancing, all singing, seven song set! This amazing show-stopper will be complimented by a touch of cabaret with Myra Dubois who has performed at the UK’s most prestigious burlesque nights and venues, also toured the UK and received almost sycophantic reviews at the Edinburgh Fringe. Pop sensation on the rise, Glen Charleston, takes to the stage with an electrifying mix of classic Madonna hits. Glen is currently putting his songwriting talents to use on his second studio album, catch him in a rare London performance! The legendary DJ Craig Jones – Resident DJ at G-A-Y and having been fortunate enough to play for Madonna and all of these amazing acts – Lady Gaga, Kylie, Christina Aguilera, Mariah Carey, Pussycat Dolls, Rihanna, Alicia Keys and so many more. David Robson – long term resident pop DJ in some of London’s most iconic Gay venues is fresh from a spot supporting the Streets, Eliza Doolittle and Chase & Status with the Ministry of Sound tour crew. Tasty Tim – He gigs all over the UK as well as Italy, Germany, New York, Australia, South Africa, Japan and Russia. Tasty is also one half of T-Total, whose remixing credits include The Pet Shop Boys, Danny Tenaglia and Cevin Fisher. Neil Prince – resident DJ at Guilty Pleasures, Carpet Burn and Wig Out and also has played parties for the BAFTAs, MTV, Lovebox, Gatecrasher Sound System festival, indigo2, Somerset House, Hed Kandinsky and the Met Bar. Dejay Kurt – Mr.MC himself. Originally from Oxford started a club night with James Lavelle and then worked with Soul II Soul, James Hymen,Roger Sanchez, Eddie Colon, Joey Musaphia and MTV. Now the man behind Madonna Celebrate. A silent auction will be held to raise money for the charity and a shop with heaps of Madonna memorabilia, records, videos, DVDs, CDs, T-shirts and posters and loads more. So bring some cash! We’ve raised over £650 so far so please come and have a good time raising more vital funds for this great charity. The official event photographer is the celebrated Fabio Taveres, from Brazil.